The bagel is a breakfast staple in most households in the United States today. They are in your supermarket and in corner shops all around town, but did you ever wonder where our love affair with the bagel began? 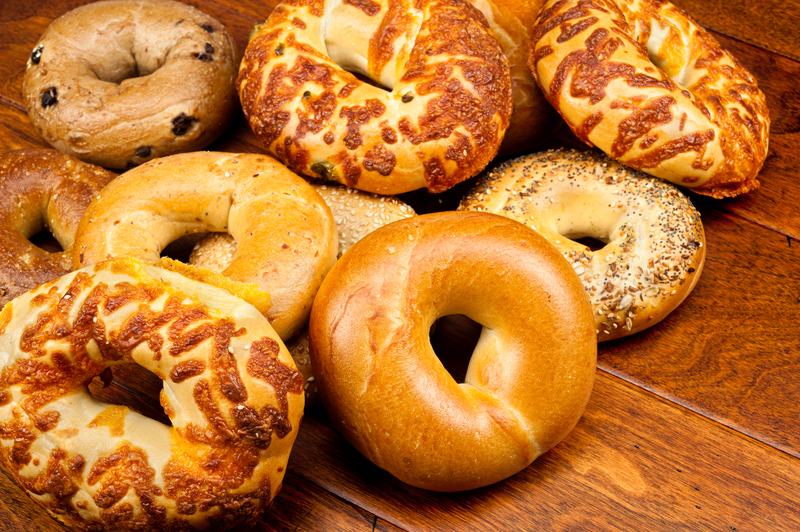 Here is a brief history of the bagel. One of the earliest mentions of a bread that was shaped similar to today’s bagel was a Polish bread called obwarzanek that dates as far back as 1394. One popular legend about the origins of the bagel or beugel in German said it was invented in 1683 to look like a stirrup as a tribute to the Polish king Jan Sobieski after he saved the city of Vienna from Turkish conquest. Other stories point to ancient Egypt and the Mediterranean area as the first time rolls with holes in the middle were first enjoyed. There were actually two types back then, a soft, sesame-studded bagele and a more pretzellike and crispier Syrian ka’ak. But other counties also have ring-shaped breads as well. The Italians have the taralli and ciambelle and the Chinese have the girde. In the United States, the bagel came over with Eastern European immigrants in the late 1800s and by 1900 there were at least 70 bagel bakeries on the Lower East Side in New York City. While the New York City Jews created a demand for bagels and other of their specialty breads like rye and challah, they were still considered a Jewish delicacy for a long time. It wasn’t until the 1950s that you started to hear bagels mentioned in mainstream media. The magazine Family Circle started including recipes for bagels that included smoked salmon, anchovies and red caviar. And in 1951, the bagel had a starring role in the Broadway comedy Bagel and Yox. It quickly became an alternative to the American traditional breakfast of bacon, eggs and toast. This was also when the Lenders family started their own brand of frozen bagels. Then by 1984 when Lender’s Bagels was bought by Kraft Foods, the bagel was constantly being paired with Philadelphia cream cheese as the perfect breakfast treat. Today, people love to eat bagels not only for breakfast, but really any time of the day. Bagel shop owners now offer bagel sandwich creations as well as typical bagel offerings and they are always trying to come up with fun flavors and combinations that keep the customers happy. Surprisingly people get very particular about their bagels. Everyone has their favorite place to buy them and their top shmears and toppings which can start a lengthy debate. One thing can’t be denied though is that young and old alike are still passionate about bagels. Bagel franchises make the perfect first business venture for a lot of entrepreneurs, but it is important that you do your due diligence to be sure that this is the right path you should take. Here are some first steps to take to get started. Ask Yourself Is This the Right Fit? Don’t forget to fill out all legal and financial documents that are important to protecting your business. In addition, make sure you have all necessary licenses and permits to run your shop. Another business option that you might not have considered before is to go the franchise route. Instead of opening an original bagel business that you have to create from scratch, join a bagel franchise like Shmagel’s Bagels and benefit from their brand power and support structure and experience in the business. Shmagel’s Bagels is a popular bagel shop franchise with two locations in Ocean City, MD. To learn more about the history of the bagel and our franchising program, call us or send us a message today.